The traditional crossing pass (cross, crosses, crossing) in soccer most closely resembles a corner kick, but it is made as part of the normal attacking run of play. Usually, a forward or wing midfielder receives a lead pass which takes him into an area of the field close to the corner flag, approximately 15-yards square, bounded by the end-line and the touchline. By kicking the ball from this location back to a space out in front of the goal, the player creates a wonderful and unique situation where the ball is moving away from the goalkeeper but into the path of on-rushing teammates. These teammates can then attempt headers, volleys, half-volleys, or any other form of shot. As a result, a significant number of goals are scored due to well-placed and well-timed crosses. Prior to the demonstration, in the right corner of the field place four discs (or three discs and a corner flag) to delineate the kicking area, and cones for a defender (on the line of the penalty area approximately 10-yards into the field), for a goalkeeper (approximately two yards in front of the center of the goal) and for a target attacker (at the far intersection of the “D” at the top of the penalty area). The coach should announce that he is going to introduce “crossing” and show the expected end result. In order to do so, the coach should first place assistants or volunteers at each of the cones representing the defender, the goalkeeper and the attacking player in front of the goal. The team should be placed just outside the sideline of the kicking area. The coach should then dribble into the kicking area and send a proper cross over the head of the defender to the attacking player (who may then proceed with a shot on goal). It is extremely important that the coach now demonstrate the two most effective ways to first learn the technique necessary to get into position to properly perform the kick. These are the “Run Around the Ball” approach and the “Personal Pass Inside” approach. In either approach, the body gets turned at the hips in order to face the intended receiver. In the “Run Around the Ball” approach, the coach demonstrates dribbling on a straight line into the kicking area, parallel to the sideline; tapping the ball slightly ahead, still on a straight line, toward the end-line; and then running in a right-to-left arc, toward the sideline and then toward the ball, in order to face the target receiver. A lofted pass with the right foot is then made. 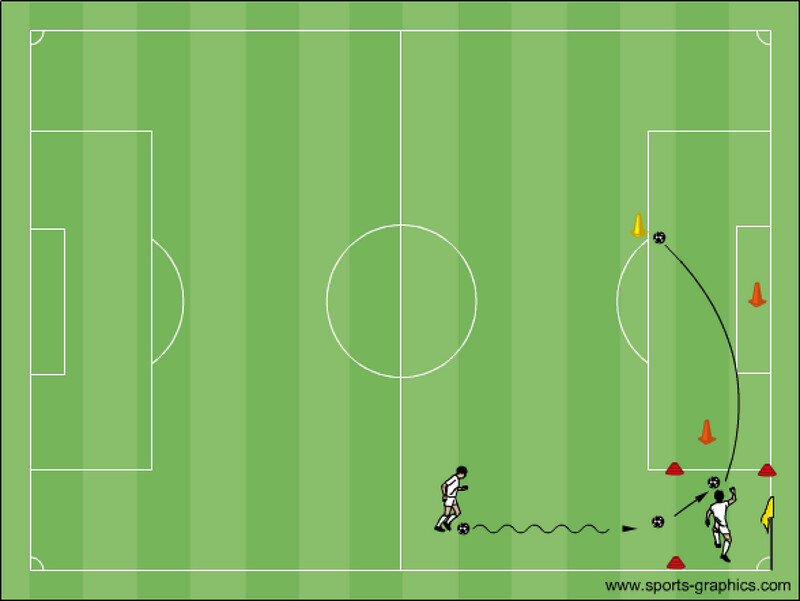 In the “Personal Pass Inside” approach, the coach demonstrates dribbling on a straight line into the kicking area, parallel to the sideline; tapping the ball at approximately a 45-degree angle (or greater, up to 90-degrees) to the left, toward the penalty area; and then running left to meet the ball, in order to face the target receiver. A lofted pass with the right foot is then made. With ball retrievers placed strategically on the other side of the penalty area and others available to get the balls back at the practice location, players practice the technique of dribbling into the kicking area, running around the ball, and making a good, lofted pass with their right foot deep toward the target cone. With ball retrievers placed strategically on the other side of the penalty area and others available to get the balls back at the practice location, players practice the technique of dribbling into the kicking area, making a personal pass to their left, and making a good, lofted pass with their right foot deep toward the target cone. Coaches should then add a live, stationary or mobility-restricted, defender in place of the defender cone and repeat the techniques above. Coaches should then add a live, mobility-restricted, goalkeeper in place of the goalkeeper cone and a full-live target attacker, in place of the target-attacker cone, and repeat the techniques above. The goalkeeper should be instructed to collect in balls sent into the goal area. With discretion, the coach may let all players go “live,” in order to simulate game conditions. The defender, however, should be restricted from entering the kicking area given that the objective is to learn how to cross. Then entire progression should then be set up and performed on the left side of the field with the crosses being taken with the left foot.